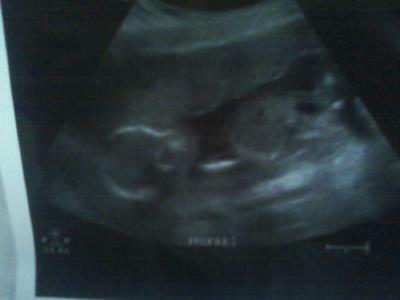 In this ultrasound im 18 weeks and 1 day. The people who have seen my ultrasound have asked me if im having twins. Now that i lokk at the picture closely it somewhat does look like twins. Im 20 weeks now and my next ultrasound isn't until my 24th week. Can anyone help elaberate on this with me? and heard both of the heart beats. I would bet a 100 dollars this is NOT TWINS!!!!!!! Does baby have a chest cavity? I am sure everything is fine with baby but it does only look like one. I am currently pregnant with twins and I found out at 8 weeks. The thing that caught my attention was the fact that in the ultrasound (gave you a crummy photo?) it looks like your baby is missing a chest cavity. Head, abdomen, legs thats all I see no arms or chest. Probably just a bad pic. Best of luck with baby. This looks like one baby to me, though i can see why ppl say twins. but it is 1. plus the hospital or doctors would not miss a twin at 18 weeks. Not true on the amnion remark and it does look like two heads lol!! But if zygote splites late enough they will be monoamniotic and monochorionic. Apparently a little scary to carry but possible for both to be just fine!!! keep us posted!!! Its plain to see it twins one on top each other you can see the skull off both babys head and see they have there own body unless it a deform baby its twins!! I definitely see twins. one on top of the other. what were u told in the hospital? More imporantly than trying to identify the parts of the baby's body is to look around the baby. If you have twins, each baby has their own amniotic sac that their cushioned within. If you look around the baby in the ultrasound photo, you see a black outline forming a bubble around the baby. That signals that there is only one amniotic sac there. Thus, only one baby. Trust me, if you were having twins, your Ultrasound Technician would have let you know. It'd be very clear by now. From this pic alone, there is one head and a body. How could your friends think there are twins from this image? Twins are very clear on U/S. Hello?????? No: you're just having one baby. The circle on the left is the skull, and the circle on the right is the abdomen. You can see the legs on the right side of the abdomen. If you look at the left, it's clearly a head, because you can see that white that represents the baby's skull; the one on the right doesn't have the white halo, so it's not another skull; it's the hips of your baby. If you really look at the other head you can see the neck/spine. So I'd say yes it's twins. Keep us update. Good luck! I'm not a pro, but. . . This does look funny to me, like it coould be two. But if so, why didn't the tech or dr. speak up? I'd call & ask to speak to one of them and just say you wondered since people keep asking. I know of a situation where the dad was the first to spot the "bonus baby," instead of the professionals, but the pros looked more closely & confirmed it! that enlarged part is his hip, not another head.